FILE - Iran's President Hassan Rouhani arrives for an address to the nation after a nuclear agreement was announced in Vienna, in Tehran, Iran, July 14, 2015. Iranian President Hassan Rouhani defended a nuclear deal criticized by conservatives, arguing on Thursday that the agreement reflected the nation's will and was "more valuable" than domestic carping about its details. The elite Revolutionary Guards, a powerful political, economic and military force, have started sniping at the deal, saying it endangers Iran's security, and have also hit out at a U.N. Security Council resolution passed on Monday endorsing it. 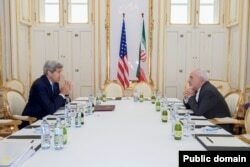 Under the July 14 accord, sanctions will be gradually removed in return for Iran accepting long-term curbs on a nuclear program that the West has suspected was aimed at creating a nuclear bomb. Iran denies it seeks a nuclear bomb Rouhani argued that the deal reflected Iranians' wishes. Pinning his political prestige to the agreement, he suggested that blocking the deal would ignore what Iranians had sought when they elected him to office in 2013. "This is a new page in history," he told a medical conference broadcast live on television. "It didn't happen when we reached the deal in Vienna on July 14, it happened on 4th of August 2013 when the Iranians elected me as their president." "How can one be an Iranian and not cheer for our negotiating team?" Rouhani added referring to Foreign Minister Mohammad Javad Zarif and the head of Iran's Atomic Energy Organization, Ali Akbar Salehi, both of whom attended Rouhani's speech. "I chose the best negotiators Iran had. They are knowledgeable and brave." The debate over details largely reflects internal rivalries in Iran's cumbersome dual system of clerical and republican rule, in which factions jostle to gain maximum benefit from the deal while shouldering the least responsibility. In remarks chiding critics of the accord, Rouhani said he had noted critics were "scrutinizing one by one the terms of the deal" done in Vienna and the subsequent U.N. resolution 2231. "That's good but what has happened is more valuable and more significant than that," he said. Rouhani said while it was important to ensure enrichment of uranium continued, it was equally important that the daily life of Iranians "should not stop", implying that the task of lifting sanctions was vital. He said that under sanctions Iran's trade had been reduced to a "stone age level." Iran's procedures for ratifying the accord are not known in any detail. Whatever the eventual role of parliament or the National Security Council, the country's highest security body, the deal will have to be approved by Khamenei, the country's highest authority. Ali Akbar Velayati, a senior adviser to Khamenei, said on Wednesday he did not know which person or body would have the final say on the deal but added "It seems the National Security Council has been assigned to examine the deal."